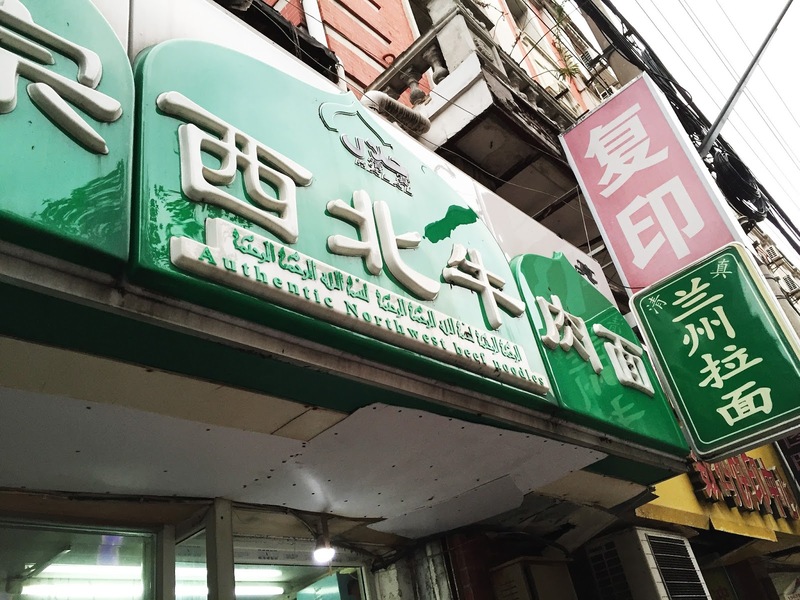 One such restaurant was called 正宗西北牛肉面(四川中路店) [Zhèngzong xibei niúròu miàn (sìchuān zhōnglù diàn)] or Authentic Northwest Beef Noodles (Sichuan Road shop). On entering we immediately noticed that we're surrounded by Muslim staff, with one woman wearing hijab and most of the men wearing kufis. It was a nice feeling! As you can tell the only thing we could read was the prices of things. 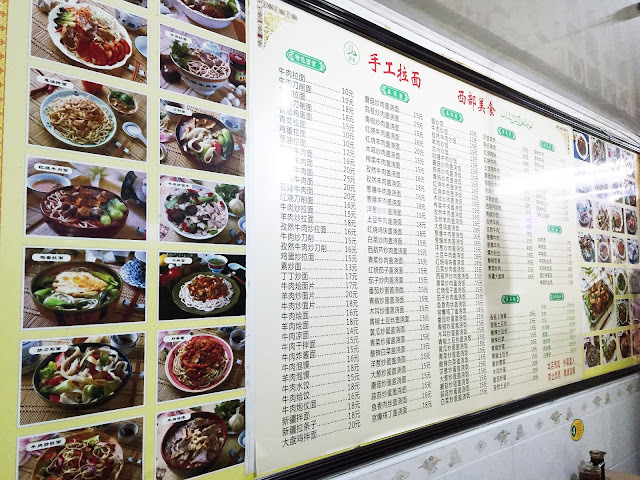 If you notice, most of the prices of the dishes are around 15 yuan, which is under THREE DOLLARS CANADIAN! On entering the shop owners seemed pretty confused by the sight of us, which is understandable since I guess seeing interracial Muslim couples isn't a commonplace sight in Shanghai. But overall they were friendly. They immediately mentioned "Lamian?" upon our entering which means a noodles and soup dish which is commonly ordered. 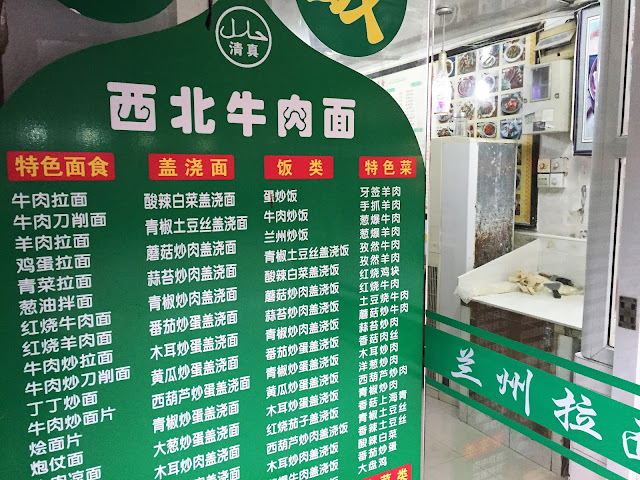 We wanted to look at the menu so we, not speaking Chinese, had to first try to mime and point to indicate that we wanted to take our time looking at the menu. The shop owners were expectantly waiting for our orders so we decided to just look at the pictures and order what looked best to us. 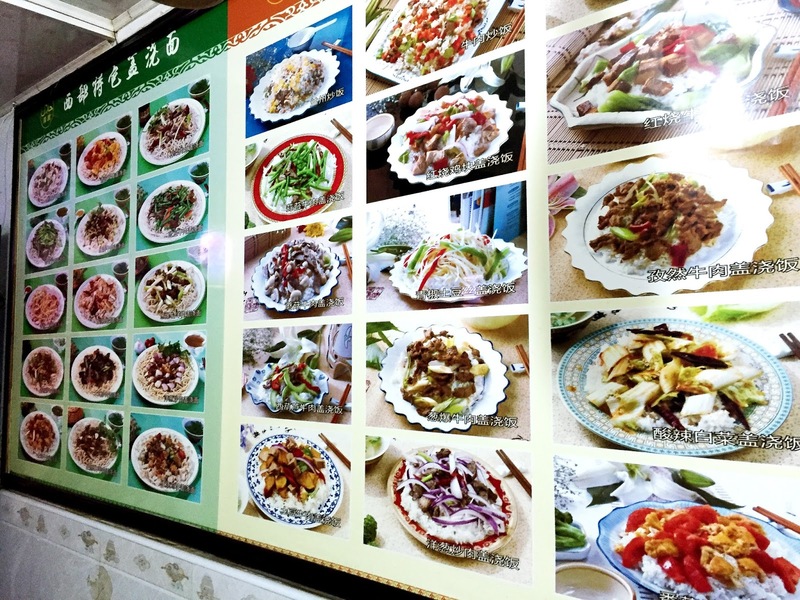 One thing was deciding whether we wanted a beef or lamb dish, as both are common and they look the same in the pictures. Just a note about the words for different red meats, always look for the牛 (cow) or 羊 (lamb) characters in front of 肉 (meat). If you happen to be at a restaurant and see 豬肉 (pork, literally pig-meat) which also includes 肉 meat character at the end, then you should probably not eat from there. So in the end we ended up going for two Noodle soup dishes, and pointed to two that we thought looked the best. The first dish was a lamb one I believe, and had a really tasty broth, slightly spicy, along with vegetables and thick glass noodles. Both dishes also came with homemade bread which was like almost a roti but perhaps deep fried, I'm not sure. It was delicious and it went with the soups so well. The second is what I chose and is also what dreams are made of. 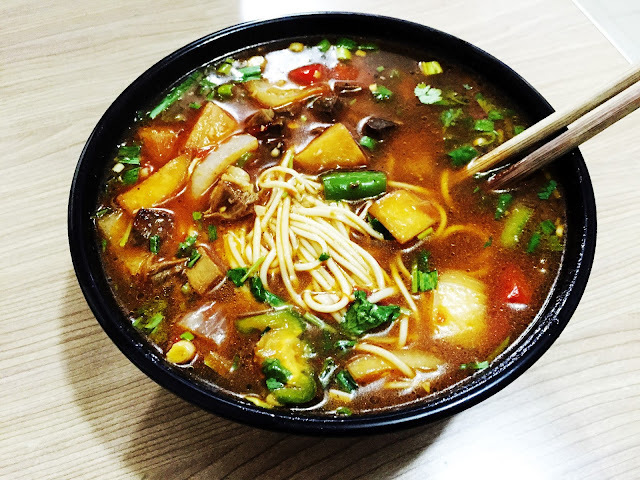 It had the signature hand-pulled Lamian noodles with a delicious beef broth, with bell peppers, potatoes, and sprinkled with coriander. It was one of the best things I've ever tasted. Refreshing, and so flavourful that it was almost a stew. I think out of all the noodle soups I had in China, that this one was the best. Here you can see the station near the front windows where they knead and pull the dough for the noodles in plain view of customers strolling by. Notice the halal symbol on the top! For a place that we found by researching on the chinese search engine "Baidu" and picking at random, it was a great success! If you're in the neighbourhood I would definitely recommend visiting. Click Here for our Shanghai Itinerary and tips for using search engines in China. 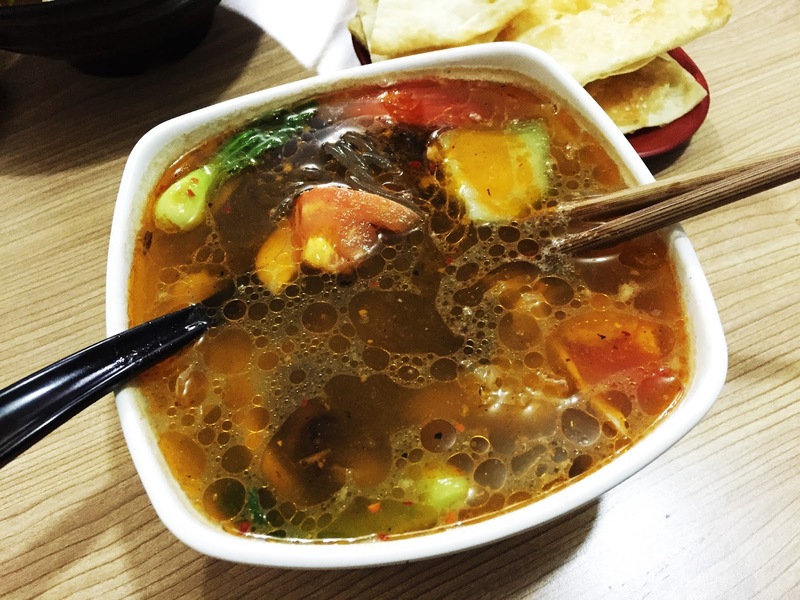 Be sure to check out other great places to eat across Asia in our Article Directory.